Believers, we have the victory! Victory over sin! Victory over death! Victory over the World! Victory over our Flesh! Victory over the devil, and his demons! 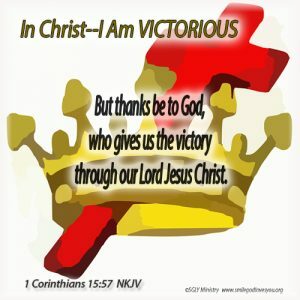 Victory over anything imaginable, because our God has given us the victory through our Lord Jesus Christ! Now….what more do we possibly need? For the past thirty days we have seen daily just who we are in Christ. I hope it has been as amazing learning experience for you as it has been for me. Please let me know your thoughts. And fellow believers, as we continue our journeys through this world, I pray we will never forget who we are in Christ and that we will walk in the blessings we have been given daily, as we bear abundant fruit that glorifies our wonderful Father God. Until we meet in heaven fellow saints, walk in victory, keep the faith, rejoice in who you are, enjoy your blessings and be fruitful daily.